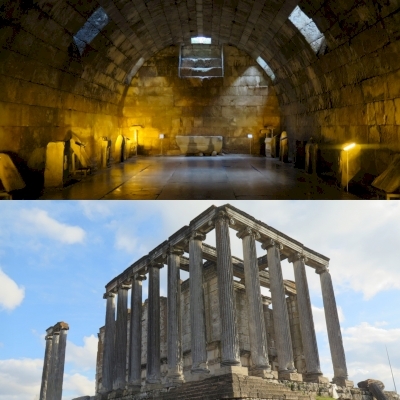 Aizanoi Antique City is part of the Tentative list of Turkey in order to qualify for inclusion in the World Heritage List. The highlight of the sites here is clearly the Temple of Zeus. It is half restored and looks impressive from the side I took a picture, with the acroterion placed in front it also in good condition. Not having done much research I didn't expect to go UNDERNEATH the temple this time - which Roman temple can you say you went to visit the basement? As you descend the steps (the same way as they did in ancient time) you feel the vibe of the sanctuary. It may have something to do with the eery music playing of course. there isn't that much to see here but what you see is quite interesting. Pedestals, broken columns as usual, an altar piece. Several have descriptions. I enjoyed this place. Although they try to keep pigeons out as much as possible they should try to close off the gaps a bit more. The temple visit only costs 6 lira! If you have more time to spare you can seek out the antique macellum (market) with the Price Edict of Diocletian, a kind of inflation ceiling used back in the days of said Roman Emperor. The theatre is mainly destroyed and not worth your time if you have seen similar ones in other areas (and I'm sure you have). The necropolis is rather mediocre. The bridge is under renovation early 2019. Combining all these may be enough for an inscription. It's a worthy visit for at least the temple of Zeus. Our trip to Aizanoi on an early spring day way back in 1989 was a great experience. The place is dominated by an extremely well preserved and photogenic temple. I was impressed by the presence of the remains of an earlier Phyrgian (or Christian?) temple that has been preserved under the foundations of the present temple. The ancient marketplace has a list of goods sold there and their prescribed prices all carved into marble in Latin! The authorities must have thought that life would never change. There is a modern but attractive (in its own way) village of �avdarhisar that coexist among the ancient ruins which is sort of pleasant, in that it shows that empires and cultures may change over the ages but life goes on at its own pace. All in all, there are few places where the ancient Roman life exhibits an almost natural continuation in a modern environment. Aizonoi was not a very important city in antiquity compared to other great Anatolian metropolises such as Ephesus which dominated life at their epoch, but the more important places also kept on changing. Compared to these places which no longer exist in their ancient state, Aizonoi is a vibrant and still lively place of antiquity, well worth the visit.